1. Cut the flank steak into roughly 3" sections. 3. Mix the oil, salt water, pineapple and the juice from one lime together in a large bowl with a lid. Add black pepper, chile powder, garlic and cummin and mix well. 5. About an hour before you plan on cooking slice the peppers and onion and put them in the bowl with the remaining marinade and mix so the marinade coats the slices. 6. Get charcoal hot in your grill. While the coals are getting hot put a cast iron pan on the grill to get it heated up. The coals should be glowing with a light covering of white ash. The temperature should be high enough that you can't hold your hand over the coals for longer than 2-3 seconds. 7. Place the steak directly on the grill. Put the peppers and onions in the cast iron skillet on the grill and close the lid on the grill. Turn the steak after 4-5 minutes and stir the peppers in the skillet. Grill the steak for another 5-6 minutes. Put the steak in the skillet with the peppers and onion and stir together and let them cook for another 4 minutes. Fajitas are always a head turner at restaurants. The reasons include the loud sizzling, the amazing smell, and the rich colors. The fact that you get to assemble them yourself also helps. These days there are several varieties of fajitas in restaurants like steak, chicken , shrimp or fish but a real fajita is always steak. 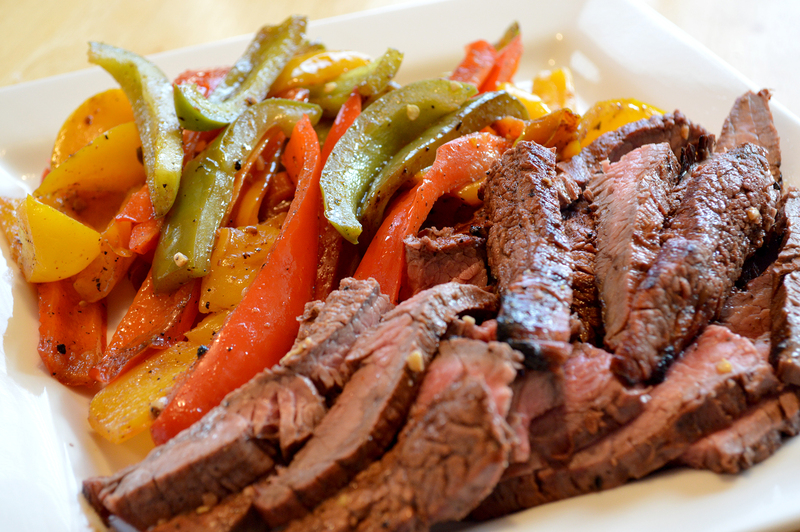 The word fajita refers to skirt steak. Skirt steak is amazing for grilling. It comes out tender and smooth yet stands up to being put on the grill and flipped around. For my recipe I used ingredients that can be found now naturally in Mexico. I know pineapples originally came from Brazil but they were introduced to Mexico long before europeans made their way to this hemisphere so I’m going to say that pineapple is native now. As with any grilled meat the two most important factors are: first, the meat used and second, the marinade. Make sure you get skirt steak for fajitas, no other cut will give you the right texture and richness of flavor that you have to have for fajitas. The marinade needs to well balanced and help bring out the natural flavor of the steak as well as being able to loosen the fibers of the steak to make it even better to eat. Since I used pineapple juice, the time that the steak sits in the marinade needs to be limited or the pineapple juice will “eat” the steak too much. If you need to have your marinade sit longer you can use lime juice and add 2 tablespoons of brown sugar. That combination will give you the same acid effect you need as well as provide some sweetness to the flavor.